Asda has announced it plans to offer 3D printing stations at its supermarkets across the UK with a trial kicking off at one store immediately. 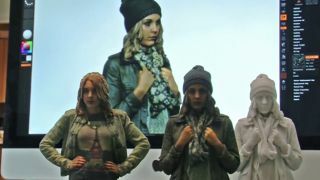 The Wal-Mart owned chain is setting up studios where shoppers can bring in objects to be scanned or even be scanned themselves within a couple of minutes to create 3D-printed 'mini me' figures of the family. The company, which has been developing the tech for 18 months, expects the figurines, which will start at £40 and can be scaled to whatever size the customer wants, will be the most popular items. "Evolving well beyond simply filling frames with photographs of friends and family, 3D printed 'mini me' figures will add a whole new dimension to shoppers' mantelpieces and the lifelike models are also expected to be popular as personalised wedding cake toppers," it wrote in a press release. Objects or people will be scanned using handheld cameras, which can grab the minutest details and capture up to six million different colours. The objects can be printed in full colour, bronze or white. Once the process it completed, the information is sent away where it will be built up using layers of ceramic and available to pick up the next week alongside their weekly shop. The trial starts in the company's York store next week, while a nationwide roll-out will take place at some point. You can check out the process in the YouTube clip below.